On-Line was a site-specific installation at the Chesterwood Museum in 2003 that was directly inspired by an installation at Chesterwood in the previous year. 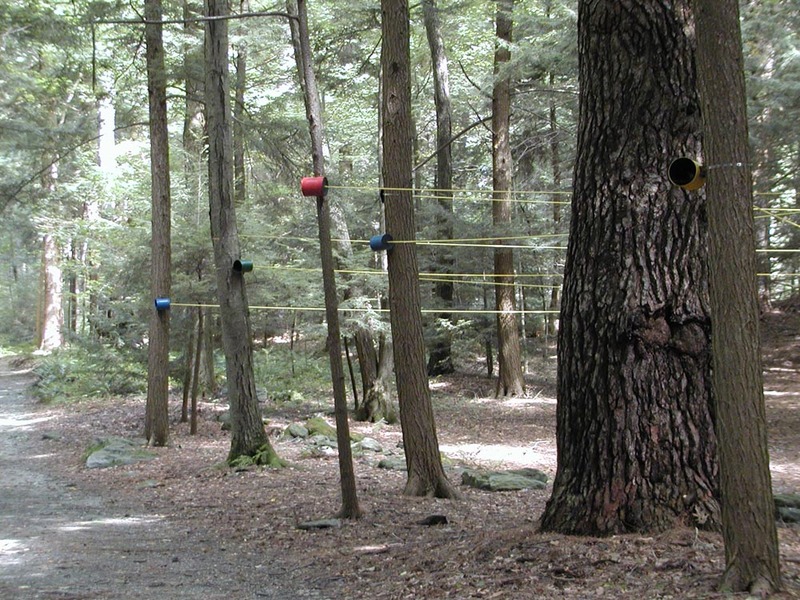 Contemporary Sculpture at Chesterwood 2002 featured a piece by Susan Rodgers titled Light Poles. Light Poles was an arrangement of tall, thin vertical tubes that were painted in primary colors. 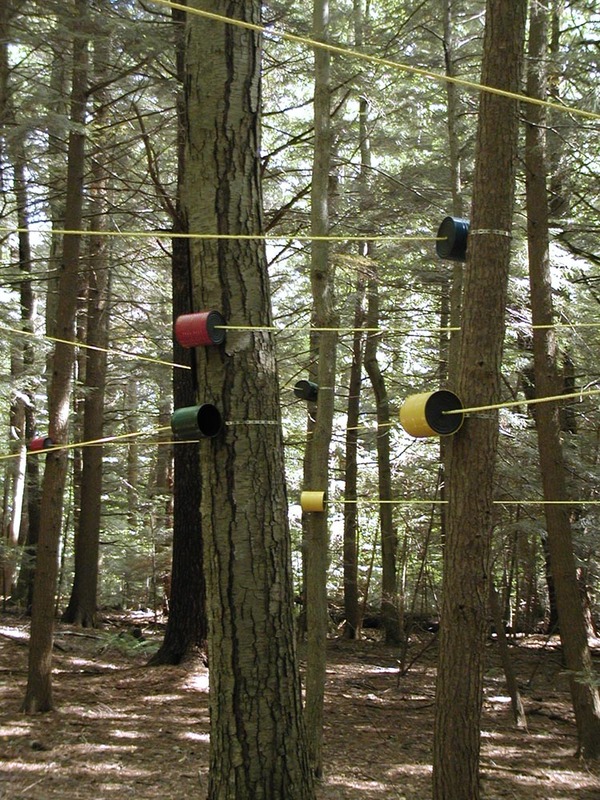 I really liked the dynamic between the line and color of the installation and the surrounding woods. Up to that point, color never figured as a significant element in any sculpture that I had done and I really wanted to experiment with color. On-Line is mostly humorous, but it does have a somewhat darker subtext. It was created out of my frustration with modern communication and desire to return to something simpler. Part of my “day job” involves managing a computer network. Our network assets are all linked together with brightly-colored wires in red, yellow, blue, and green. I am frequently frustrated with the inefficiency of digital communication and have sometimes thought that it would be better if we went back to tin cans and string. 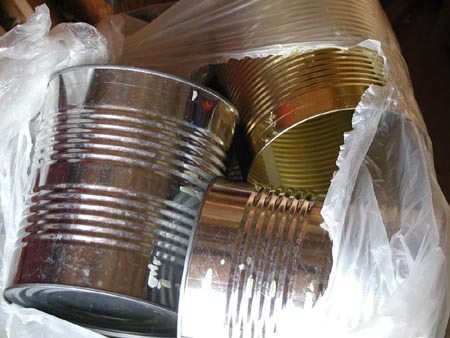 On-line was constructed from recycled #10 steel food cans that were obtained from a school cafeteria. 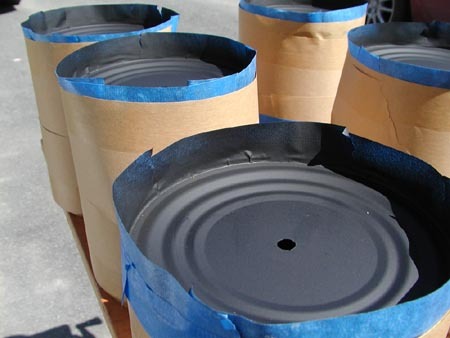 They were painted in glossy colors on the outside and flat black on the inside and bottom. The cans were attached in matching color pairs to a grove of trees at a height of 10 to 15 feet. 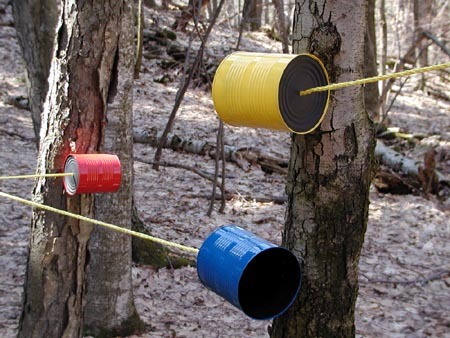 The cans were connected to each other with bright yellow poly rope. On-line was accepted for Contemporary Sculpture at Chesterwood 2003 (curated by Janis Keane Dorgan). I brought 32 cans with me to do the installation and used 30. I went in with no set plan for how they would be arranged, but I did know fairly early on where the installation would be sited. It took about 9 hours in the rain over two days to complete the installation. There was a central clearing in the installation. One of the best places to experience On-Line was standing in the clearing. A lot of the meaning of On-line was derived from the process. As much as I wanted to return to something simpler, I just could not get there. This simple children's toy had taken on almost threatening proportions. The crossing overhead lines and bright colors gave the grove an unnatural tension. 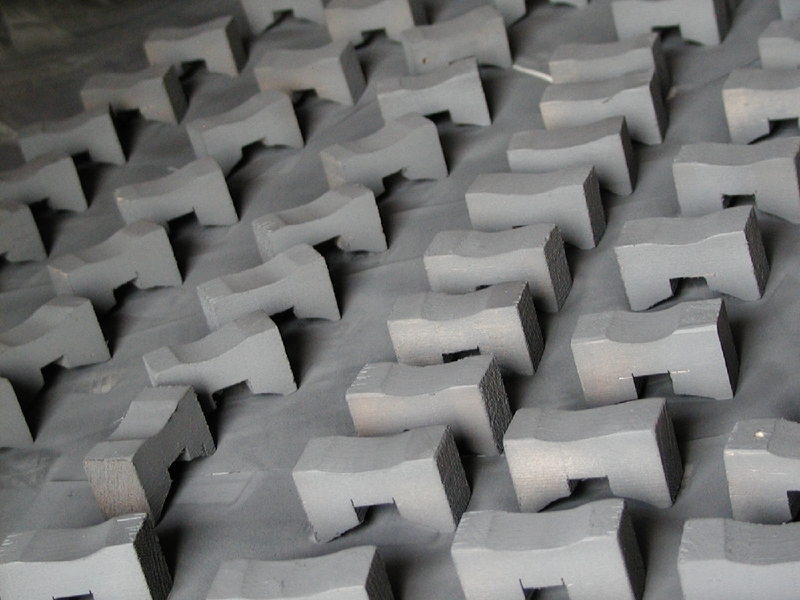 It was hard to see how the installation had transformed its environment, because I had built it gradually over several days. However, removing it only took about an hour. Once the cans were down and boxed, the buzz was gone and the site felt very different to me. The elements from this sculpture are still boxed from the day that it was removed from Chesterwood. I don’t know if I will install it anywhere else. Outside masked, painting the inside and bottom. 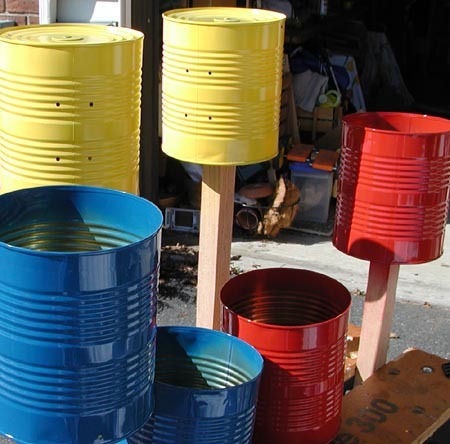 Wooden cleats were used to attach the breeze clamps to the cans.